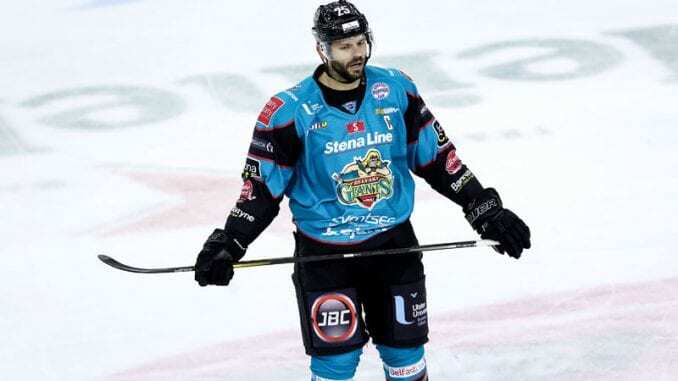 Belfast Giants captain Blair Riley is the first ever winner of the British Ice Hockey Player of the Week award. The 33-year-old picked up 35% of the vote, beating rivals Calle Ackered of Guildford Flames, Joe Basaraba of Fife Flyers and Coventry Blaze goalie Jordan Hedley. It was a weekend that saw the Giants pick up six points from six on a road trip in Scotland, plus five goals and an assist for himself, including a hat-trick against Glasgow Clan. But despite sitting top of the table, Riley insists they’re not looking too closely at what their rivals are doing, despite results going their way, leaving four points clear at the summit. “Winning in Fife on Friday set the tone for the rest of the weekend and we decided we would take it a game at a time and not look too far ahead,” Riley said. “We started off the right way and it was on to Glasgow. I’d never scored a hat-trick in my pro career so I definitely didn’t expect it. “I’ve been playing on a line with (David) Rutherford and (Darcy) Murphy for a while now and things have been clicking recently so it was a good feeling to get it. “It’s early in the season so you don’t want to be scoreboard watching at this point. You’d rather be focussing on your own form. “But when the top teams drop points, it’s beneficial certainly, but we’ve got a long way to go and a lot of games to play. “There’s definitely a bit of exhaustion now. Three games is tough on the body, especially when you factor in travel and that all the games were on the road. It’s a hectic run of road games for Adam Keefe’s side, who return to the mainland this weekend, to face Nottingham Panthers on Saturday then a trip to Cardiff Devils on Sunday. Although Giants are on a run of five straight wins and one loss in 14, Riley admits these games will be an indicator of where they are, despite their lofty position. He added: “The two games this week will be a test of where we are, but every game is a test for us right now. There’s not a big gap between top and bottom and dropping points can feel like a setback. “There are a lot of teams within striking distance, but we look forward to getting back to practice and planning for the games against Nottingham and Cardiff.